I‘ve found that on network tv these days there’s nothing much on that’s good to watch. Not counting LOST, of course. If you want some good quality television, cable is where it’s at. Unfortunately, I do not have cable. Fortunately, I do have netflix and netflix has DEADWOOD. Now this is a great well written show that only ran for 3 seasons on HBO that is definitely worth checking out. 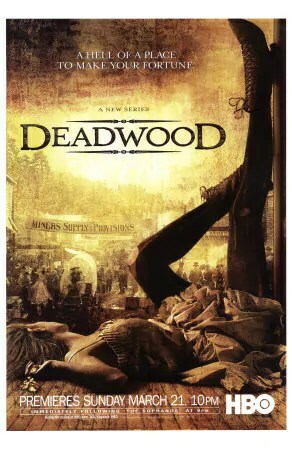 My brother Jesse told me the other day that Deadwood reminded him of Shakespeare and that he imagined that if Shakespeare had written a show about the wild west then Deadwood would probably be it. I have to agree. I just finished the final episodes of season 3 and only hope they make a film version soon.